How Reaktor Tips shopping works: upon receipt of payment, within minutes you will receive an automated email containing either decryption keys for the instruments you have purchased (Loupe, Mirage, ParamDrum) or a link to the instrument file (Chroma). Requirements for all instruments are the same: the latest full version of Reaktor 5 (NOT just the player version) and a suitable computer, OS and sound card that are compatible with Reaktor 5. For further information on system requirements see here. Note: As of November 2013, I have not released anything authored in Reaktor 5.9, so if you have 5.8 you’re good to go! 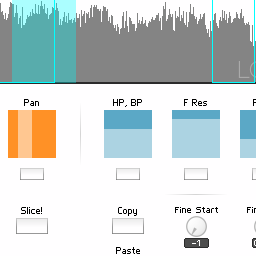 Loupe 2 is a polyphonic looping slicer for quickly mapping arbitrary sections of a sample to different MIDI keys. More info here. Loupe is self documenting through extensive tool-tips. None of the controls are too small or too fiddly. You can learn how to use it in minutes but I think you’ll find a million uses for it. This reflects my instrument building philosophy that an instrument should give you musical leverage without making you feel like you’re endlessly flipping switches on a room-sized computer from the 1960s. 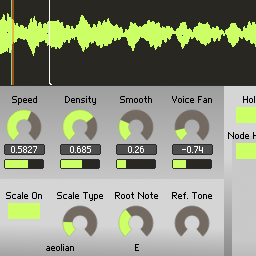 Chroma is a performance oriented monosequencer and VA carefully tuned for ergonomic ease of use and glitch free operation in standalone and plugin mode. Slur features in Chroma match up with legato and glide features in the Gris-Gris synth to create a slinky sinuous note articulation. More info here. 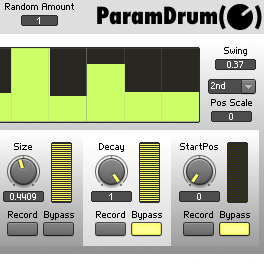 ParamDrum is a fun and fast way to create unique sounding beats in Reaktor. It’s based on three granular samplers with built in parameter automation and variable length and speed step sequencers. 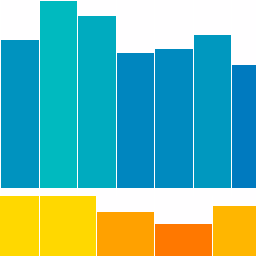 The value of a step gives the probability that the step will trigger as the sequence plays, creating endless variations. It has a fun and fast workflow, and the ability to produce sequences that will surprise you as you create them. 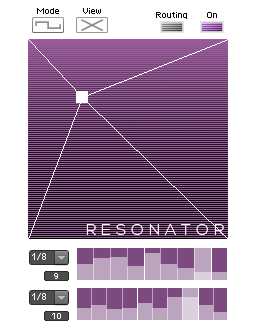 It’s not a one-button “tada, here’s your beat” randomizer, nor is it a traditional sequencer that expects you to painstakingly determine every detail. It’s a nice balance between the two. I put a lot of effort into the usability and workflow and I hope you’ll find it as much fun as I do to work with.